mcxNOW will be going into a maintenance period beginning November 15 2014 and lasting at least some weeks to address some issues concerning wallet use and the number of system administrators able to resolve problems. We will also take this time to perform some feature requests from users. All wallets here will be removed to make way for a new wallet system meaning you will need to withdraw all your cryptocurrency holdings prior to this cutoff point. Any coins left in mcxNOW at the cutoff point will be destroyed. Existing wallets and all backups are going to be shredded to maintain privacy of users. 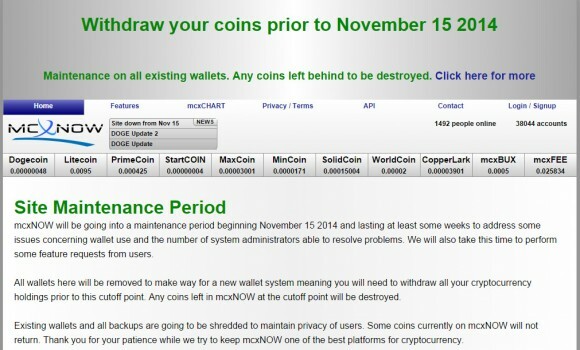 Some coins currently on mcxNOW will not return. Thank you for your patience while we try to keep mcxNOW one of the best platforms for cryptocurrency.